Happy Wednesday and welcome to Ellibelle's Crafty Wednesday post! It's a new month already and that means it is time for a new challenge! 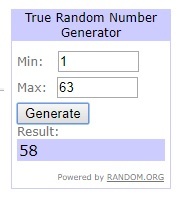 There were many wonderful entries last month and I decided to add top picks in addition to the random winner, so be sure to scroll down to see if you were the winner or a top pick. "For Ladies or Girls Only". I made a Clean and Simple Card today, using the Stamp Fluffy Passenger along with the Stencil set Oscillations. I stamped the image using Memento tuxedo ink (my go to ink when using copic markers) on Copic Xpress It Blending Card and then used copic markers for coloring. The Rays Stencil is by Stampers Anonymous. 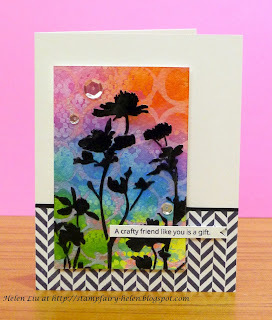 I used Tattered Rose Distress Ink to add the sun ray design. One of the designs from the Penny Black Oscillations Stencil Set was used to create a "road" pattern. The sentiment is from Tim Holtz's Quotations Sticker set. (Yes, I admit I'm a little bit addicted to this sticker set and wish it came with even more sentiments!) Framed the image panel using some dotted designer paper by Prima Marketing . I don't think the pack I used is still available - I used the paper pack called "Something Blue". No blue papers though in this pack, I think it's meant to be wedding themed papers. The card base is a simple white Neenah Linen textured card stock 80lb weight. $5.00 Gift Certificate to Mo Manning's Digital Pencil Store. Find today's products and many more online at Amazon! Simply use the "search" box below to find something in particular and don't forget most products qualify for free shipping at $25. >This post contains affiliate links, this means I may earn a small commission if you purchase something through the links, at no additional cost to you. Thank you for your support! Congratulations Vickie, please be sure to email me at ellibelle_blog at yahoo dot com by May 16th to claim your prize. I am so sorry but in order to comply with the new GDPR regulations, I decided to remove all links to the top picks/winner. Congratulations ladies, your top pick logo is below, feel free to post it to your blogs if you like to! If you would like to join in this month's challenge, simply use the linky tool below. Enter up to 3 times with a new project. You may combine with any other challenges. Be sure to add a link back here to my blog. Anyone not following these guidelines will unfortunately be disqualified from the drawing or top pick to make it fair to all those following the rules. Please note: by joining and sharing in a linky party or challenge on this blog you grant the blog owner permission to post your first name, blog link and artwork you linked up here on this blog, should you be the selected winner/top pick of a challenge. Do not enter any linky tools if you do not agree to these terms. Furthermore, this is a public blog, meaning any papercraft you link up or any comments left on this blog will be visible and clickable by third parties. The blog owner is not responsible for republished content from this blog on other blogs or websites without permission. ETA: In order to comply with the new GDPR regulations, I have decided that all winners and top picks will be selected from non-EU entrants. It is my believe that if I post someone else's creation on my blog as a top pick, it should receive proper credit by linking to the top pick's blog (because isn't that why we share our creations in blog land), but because I do not want to break any regulations, I am no longer able to link to individual blogs from the EU. Thank you for understanding. Ohhhhhhhh this is just gorgeous!!!!!!!! A super card as always and fab colours and background as well Ellie. That image is great - and I really like the stencil background - I have a similar stencil and this encourages me to dig it out to use it! Thanks for entering the anything goes challenge at QKR Stampede this week. So beautiful. Love the details and cute critter. Thanks for joining the challenge at Tuesday Throwdown Blog. Happy Crafting! Thanks so much for playing at the Penny Black Saturday Challenge! Very pretty and I love the sentiment! Thanks for joining us at Tuesday Throwdown! Very fun card, so pretty and colorful. Love the bright vibrant orange with the subtle peach. Thanks for playing with us at 4 Crafty Chicks. Just love the subtle look of the stencils in the background - everything is perfect here! 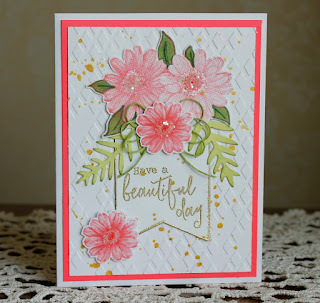 Congratulations on making Top 3 over at heARTful stamping challenge this week. I hope you'll be back! JUST LOVE THIS IMAGE, you colored it very well and I love the way you matted it. Very clever paper choices and accents. Thanks for sharing your talent at Colour Crazy Crafty Challenges.